The background to the Wharncliffe and where it originated in Sheffield dates it to the early 1800s… The most common historical background you will find suggests that Lord Wharncliffe was a patron of Joseph Rodgers & Sons “Cutlers to Her Majesty” and presumably the blade was produced through that arrangement - but there is not any solid evidence of that knife. Nonetheless this occurred no earlier than 1826 which was the year James Stuart-Wortley-Mackenzie became the first Lord Wharncliffe. Notably multiple Lord Wharncliffes lived in the 1800s all of which were related on a family tree. The first Lord Wharncliffe as noted above lived northwest of Sheffield (in the village of Wortley; in the parish of Tankersley). However there were 2-3 more generations in the 1800s all highly affluent and involved in multiple businesses such as the railroad or cotton industry while another Lord Wharncliffe was involved in politics and supposedly served in Parliment… When Wharncliffe blades and accordingly knives were first sold and used extensively is unclear but I have seen an 1850s era Unwin and Rodgers advertisement which showed a Wharncliffe whittler configuration and have seen a few early Rodgers Wharncliffes but the date of manufacture for them was unknown. No doubt the pattern became popular and was made through the 1800s (multiple companies in Sheffield and the USA - perhaps in other countries as well but I am not familiar with them), survived the 1900s (eg., Case Seahorse) and has remained even popular today as evidenced by GEC, for example, which is just one modern company that makes traditional patterns. The blade is considered a strong blade for wood cuts but generally good for many uses, and importantly as originally designed it was to be extra heavy with a thick arched spine for strength. Only have a few;a couple in horrible shape(the W.T.Staniforth and the Carrier)but thought I'd post them anyway. The Empire is in great shape and came with a purse and the G& J Allen;kudging by the pique work dates to around 1840-1850. Nothing vintage but these two have wharncliffe blades. Beautiful knives Lee, really like them both! Good bit of anecdotal history as well. Knife7knut, very nice Empire and that old Allen with the pique work is great! Nice Case's, steve, I like the bone on the first one. I only have one Wharncliff pattern knife, an IXL George Wostenholm. The flow of the Wharncliffe frame with the Wharncliffe blade is an example of "Art". The shapes come together to create a new and visually appealing 'whole'. It's "Art" because most people find it instantly appealing. To me this is what is so special about Traditional style knives. The old Sheffield cutlers figured out the exact dimensions, proportions, & curves to create a 'whole' that is truly beautiful for every one of the vintage patterns. In addition their designs place the handle and the blade in just the right position to be natural in hand with the blade in position ready to cut. Custom knifemakers can tweak these patterns but they are not improving them, just changing it in minor ways making at best, an equally 'right on' knife. 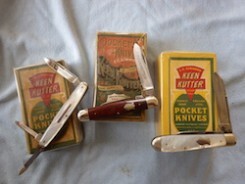 I collected thousands of folding knives before this understanding of vintage Sheffield cutlery became obvious. danno50 wrote: I only have one Wharncliff pattern knife, an IXL George Wostenholm. Very nice, what is stamped on the blade face? Some Robesons. First three are mine, last one with the etch is not. The stag 008 whittler has "birdseye" rivets. Robeson did not start using pattern numbers until shortly after 1900, and when they did they gave this pattern the number 008, the 8th knife pattern to receive a pattern number, so they were making these early on. The black handled knife, I bought off Ebay, but never made my own scans. I tried to buy the A. Munson & Son knife, but was outbid in a big way. How about this 2009 "Happy Halloween" CASE that I have. Beautiful knives kootenay joe and Charlie. Enjoyed, and agree with, your words on the ART of traditional knives, joe. Dimitri, the blade is stamped "CIVIL SERVICE CAN....", I assume it used to read CANADA and the ADA is worn off or was unevenly stamped in the first place. That is definitely a Wharncliffe knife, tj. Dan - that is a super nice Wostenholm - a whittler with stag and the swedge is sooo nice ... thats one beauty!! Charlie - Robeson made some super Wharncliffes - nice knives ... thanks for posting those great Robeson examples!! TJ - Probably the most unique Wharncliffe one would find in the whole history of that blade style - Cool !!! Here is an I*XL I removed the plastic handles and put some stag on it. That is one nice knife Dale ... nice job on the rehandling to stag too!!! Finally getting around to posting these three knives. Top to bottom: Miller Bros.